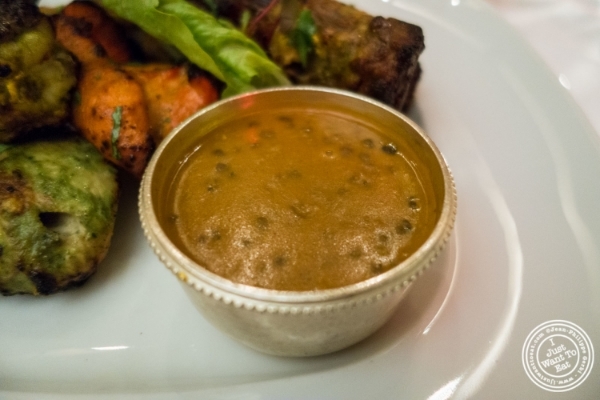 For her Birthday dinner, Jodi wanted to go to Tamarind, the elegant Indian restaurant located in TriBeCa. We went there last year, for Restaurant Week, and had an amazing experience. The decor is spectacular: very high ceilings, modern and very elegant, not at all over the top. This time, we were seated in the Lotus Room instead of the main dining room. We started off the evening with a complimentary puff pastry that we dipped in a sauce that had ginger, as well as other spices that I admit I had difficulty to identify. Served with mint and tamarind sauce, they were deliciously crispy and not spicy at all, with a nice filling made of potatoes and peas. I also could not resist trying their chili crab, a dish I only saw at Baluchi's. Then came our entrée. At first, Jodi ordered some dal makhni, but the waiter told her that it was medium spicy and that anyway, I would have some in my dish. So he suggested that she picked a different dish, a gesture that I truly appreciated. So she went for the saag paneer, a dish made with spinach and cottage cheese. I am not a big fan of spinach, but admit that I liked it, especially the cheese (paneer) that seemed to be home made. On my side, I went for the tandoori mixed grill, composed of lamb chop, shrimp, tandoori chicken, tulsi kabab (boneless chicken, tandoori spices, basil), Punjabi tikhe (Boneless chicken marinated in yogurt, roasted whole spices, jalapenos, ginger, garlic), black lentils (dal makhni). That was a fantastic dish and my favorite was definitely the lamb chop that was perfectly cooked. The chicken, in all the different versions it was served, was also delicious, tender and moist, with a nice char and incredible favors coming from the spices used. I definitely recommend this dish if you love tandoori and meat, although know that they also have a seafood version that looks amazing. With the mixed grill came some naan, but we also decided to try their mushroom and truffle naan bread too. The aroma of truffle oil was very appetizing and the naan were spectacular: fluffy, slightly charred, perfect to eat with the saag paneer or dal, instead of rice, of just like that, without anything. We could not resist ordering desserts. Jodi decided to order a coconut mousse bomb, that was like a pineapple cake deconstructed. On my side, I went to the usual gulab jamun, these cheese balls that are fried and dipped in a sugar syrup. Despite that, I still consider Tamarind to be a great place and highly recommend it, if you want to go to an elegant Indian place: the food was simply fantastic.